Hyaluronic acid (HA) is a biopolymer with wide biomedical and cosmetic applications, wherein the molecular weight of HA (MWHA) is an important quality parameter that determines its suitability for the targeted application. To produce HA with desired molecular weight, it is important to identify parameters that offer tunability and control of MWHA at a desired value during fermentation. In this work, two tunable parameters, viz. glucose concentration and combination of HA biosynthetic genes expressed, were used to produce HA of different molecular weights. 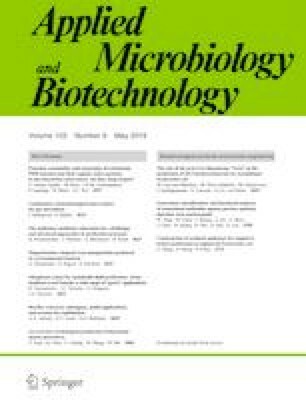 Three recombinant strains of Lactococcus lactis were constructed, using a combination of the has-operon genes from Streptococcus zooepidemicus (hasA, hasB, hasE) and the α-phosphoglucomutase gene (pgmA) from L. lactis. Batch fermentations of these recombinant strains at different initial glucose concentrations enabled production of HA with different molecular weights. Co-expression of hasABE was observed to be particularly effective in improving the MWHA. It was observed during batch fermentations of all these recombinant L. lactis cultures that the MWHA decreases steadily during the later part of the fermentation and the final value is 19–43% lower than the peak MWHA produced. Analysis of the fermentation data showed that the decrease in MWHA correlated strongly with the decrease in specific productivity of the culture. To overcome this decrease in MWHA, a glucostat strategy was successfully devised which could maintain a high value of specific productivity throughout the glucostat phase and result in constant-MW HA production. Glucostat processes were designed with the three recombinant L. lactis strains at two different glucose concentrations to produce constant molecular weight HA ranging from 0.4 to 1.4 MDa. This is the first report of its kind in literature that demonstrates production of controlled MW HA over a wide range by using a combination of tunable parameters and suitable process control strategies. Pandeeswari Jeeva and Sreeja Shanmuga Doss contributed equally to this work. The online version of this article ( https://doi.org/10.1007/s00253-019-09769-0) contains supplementary material, which is available to authorized users. The authors would like to acknowledge Indian Institute of Technology Madras for providing infrastructure to carry out this work and Ministry of Human Resource Development, Government of India for providing Fellowships to Sreeja Shanmuga Doss and Pandeeswari Jeeva. The Department of Biotechnology (Ministry of Science and Technology, Govt. of India) provided funds to execute this project through Project No. BT/IN/Finland/30/GJ/2013.